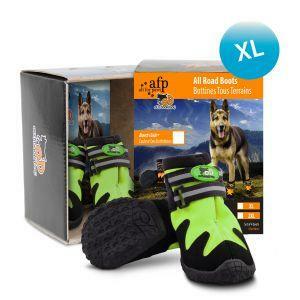 Sometimes your dog’s paws need a bit more protection from the elements and these Outdoor Dog All Road Dog Boots by All For Paws do just that. There are so many reasons why your dog would benefit from wearing dog shoes and these All For Paws All Road Boots are ideal to give protection when needed. Whether it be the cold, snowy and icy conditions of winter or the hot rough rocks on a summer country walk. The All For Paws All Road Boots help to protect against salt and grit used on roads and pavements and stop cuts from sharp objects or glass lying unseen in the long grass. They can also be worn over a bandage or injury to keep it dry and clean. They are even great for older dogs who cannot stand on a slippy polished floor or climbing steps in or outdoors. The All For Paws All Road Boots are durable and suitable for outdoors, walking, running or indoors as the outer sole doesn’t leave marks. With weather-resistant uppers, you won’t have to worry about the terrible weather outside. The reliable, adjustable hook and loop cinch strap help to keep the boot secure and in place.